I could talk for days about how great this book is, but I’ll try to limit it as much as I can. Simon vs. 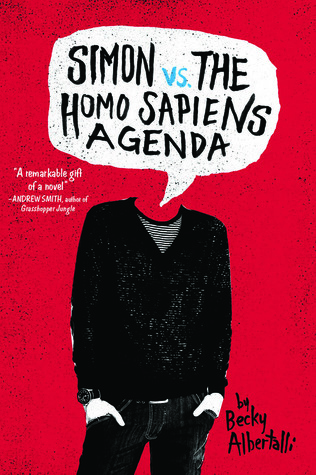 The Homo Sapiens Agenda follows Simon Spier, a closeted 16-year-old who has been talking through email to another closeted gay guy at his school. The catch is- he has no clue who ‘Blue’ is. The situation is made worse when Simon’s email falls into the wrong hands and he gets blackmailed by the class clown. This book is filled with a witty and fun writing style – that still manages to bring out tears when the plot calls for it – relatable characters, and just so much heart. I tore through these pages, invested in these fictional lives that felt so true and honest. This book kept me glued to the words on the page, laughing and crying with these amazing characters throughout the story. Becky Albertalli’s characters live and breathe on those pages, even the characters we don’t see often. You can tell how much work she put into creating Simon as well as his friends and family. His story, and the stakes, all feel real, and you feel for him. Simon perfectly portrays what it’s like to be gay and in the closet, afraid of showing the world who you are. The message of this story is so important. Yes, a lot of coming-of-age stories are about acceptance, embracing yourself and being who you are, but there’s something special about Simon’s. There’s something special about this book. It’s not one you would want to miss. Simon vs. The Homo Sapiens Agenda is the perfect contemporary. This book will take over your life, and you will be so glad it did. Great review! I’m reading this book right now and loving it. Also, love your bookstagram!